May 2012: What I Bought | Save. Spend. Splurge. Aside from my chopsticks purchase, I really thought I haven’t been spending much… but then I went through my budget and realized I bought more toiletries than I remembered! I have been looking for another moisturizer than my argan oil (I suddenly developed a reaction to it that has caused my skin to break out in little raised bumps), and I didn’t want to go back to the Skye moisturizing cream that worked so well for me, because the perfumes were REALLY strong in it. This stuff is seriously pricey. I was taking samples like crazy from Sephora to keep trying it out (I was scared of another argan oil repeat), until I realized that my skin loved it, and I should just buy the damn bottle. I should mention that it is NOT as moisturizing because my skin does feel a tad tight/dry after applying it, but it absorbs well and doesn’t feel heavy or sticky. This is crude oil from dead dinosaurs (refined of course) you’re putting on your FACE!!! Isn’t it sticky and gross? It works. I feel guilty, but IT WORKS and it is CHEAP. It doesn’t break me out, surprisingly!! It has really kept the moisture in! Yes it is. I won’t lie about that. Yes, why the hell aren’t you using it too!? And let me tell you that not only does Ms. Tyra Banks and her momma endorse it, my momma does too. My mother has the most beautiful skin of someone her age, and her secret is petroleum jelly. I apply the DDF cream at night, then I seal it in with a $3 tub of petroleum jelly. Voila. I wake up in the morning, do the Clarisonic Mia brush thing, and my skin has never felt healthier, softer or more amazing. It also cured my eczema, to boot! I’ve been slathering it on my stubborn spots of eczema and my skin has finally healed after months of applying steroids and trying not to scratch it. (I also take an anti-histamine at night to calm down the crazy itching). 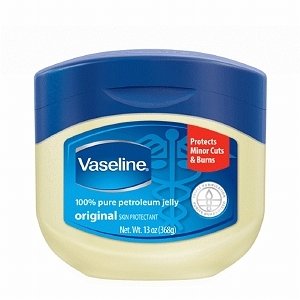 Get the plain ol’ petroleum jelly that is a bit soft and easy to spread, or else you’ll be tugging unnecessarily at the skin. I also picked up this product for the daytime because wearing sunscreen is SO important I can’t even begin to tell you. I originally wore the Pure and Simple All Natural SPF 30 cream underneath my makeup but it made everything really slick, shiny and oily-looking, and my makeup felt like it was sliding off. I still love it, but I’ve stepped it down to only the days when I am not wearing makeup (e.g. weekends), and I will be running errands outside (any day of the year). 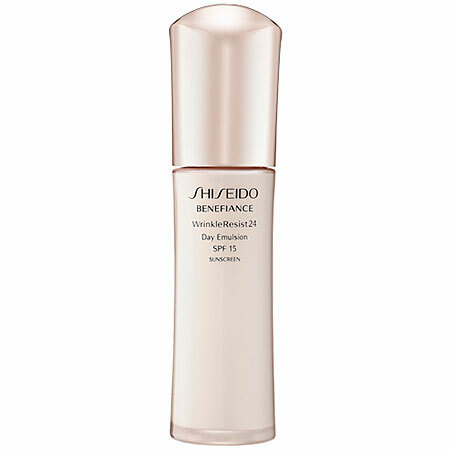 So I bought this SPF 15 lotion on the recommendation of a Sephora salesperson, and it absorbs into my skin BEAUTIFULLY. Yes, it looks a bit oily, but at least I don’t have a white mask on my face (natural sunscreens do that), and I can wear it under my makeup. I love it. And I really spread it on, knowing that putting a little on, may not do the trick. That’s about it for this month! Will you please update us at the end of the month and let us know how the petroleum jelly is going? I’m hesitant to try it, because I know some times it takes a little while for the breakouts to show up. I’ve been using it for the whole month of May. Actually, since mid-April, so a month and 2 weeks. No breakouts so far. All I get is super soft skin!!!!! I do know that for some people it DOES break them out, but that’s more of a a myth than it is true. If your skin is REALLY sensitive and you ALWAYS break out, don’t use it. Otherwise, I find my skin loves it.